Transportation is a very specialized industry. It has very specific needs, which means that if you have a website for your transportation company, which is important if you want to reach more people, you have to look for a platform that will best support your needs. WordPress is one of the most reliable website building content management system out there, offering many benefits for those who want to make a website with them. It has many plugins, extensions, and add-ons, so you can fully personalize your transportation website to support its needs. It also has excellent customer support, so if you are a first-timer, you know someone’s going to take your inquiries. In addition, WordPress is known for rare downtimes which could be bad for business. What’s nice about WordPress is that all these services specifically to cater the transportation industry can be found in many themes of WordPress. To make your search easier, we have identified the best transportation WordPress themes that we think could really bring out the best in your company website. These themes are highly functional, making them powerful enough for your online presence. They are also designed-well, ensuring that customers will keep wanting to go back to your site. 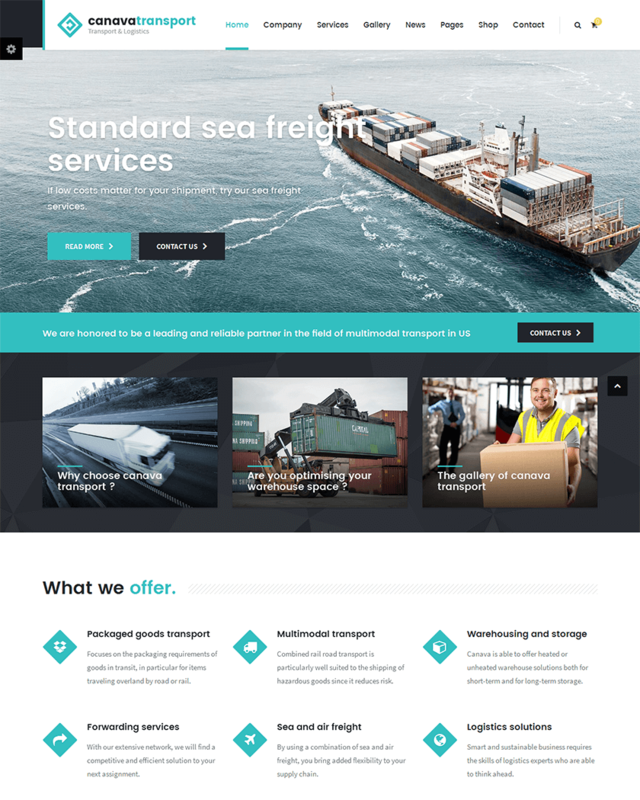 Transport is a good WordPress theme for company websites, particularly for those in the transport, as the name suggests, and logistics industry. Its interface is very standard for company websites, allowing for a lot of information for potential customers and clients. It’s easily customizable, too, as it has an improved theme options for the ones building a company website through a visual composer. This ensures that you follow your brand rules through accents and colors. Other features include a revolution slider, header types, Google Maps so your clients know exactly where you are, SEO optimization, and WooCommerce compatibility. This is also good for transport companies that have a good social media presence as it is also integrated in major social media platforms such as Facebook and Twitter. It allows for a streamlined online communication for the transport company. The developers made sure that it is easy to install and that Transport is highly functional through creating six demo installations to act as guides. Logistics has a modern, clean and design, but it is highly functional and fully-equipped as well. Not exactly different from other company websites out there, Logistics has standard features that companies will find necessary and helpful. Standard features of Logistics include various layout features, slider options, navigation options, plugins, and custom widgets. Developers ensured that Logistics will not eat up precious time of company builders by being easy to install and update. To guide companies, Logistics developers included a one-click demo installation. Logistics is also compatible with major browsers such as FireFox, Google Chrome, IE9+, and Safari. This is always important for company websites since many people use these browsers. As mentioned, Logistics has many custom widgets set. Aside from social media, it also has custom widget sets for popular posts, recent reviews, and advertisements. Companies will surely have more room to move around their website and highlight their transport services through their widgets. Transit is the Transportation WordPress theme for the modern age. Its design is easily contemporary and sleek. It works for companies who want to be perceived as extra professional and experts in the transportation industry. 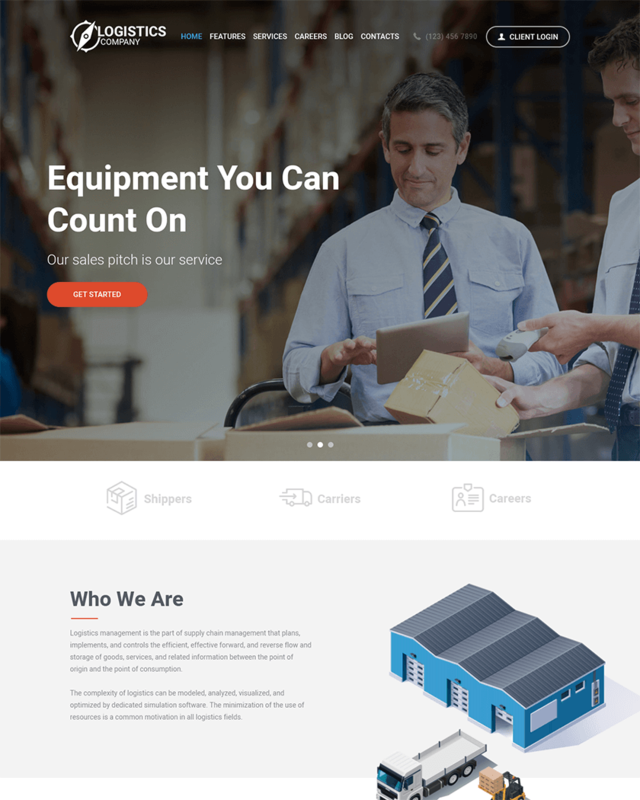 This theme is powered by TemplateMonster’s drag-and-drop builder, which makes it really easy for companies to make adjustments to their website. No more tweaking of codes, especially for those who are not well-versed with codes. In addition, Transit is SEO-friendly, certified by Google in terms of page speed, and GTmetrix. This ensures that your company will not be left in the dark and will surely reach a potential customer, if SEO is maximized. Big transportation agencies know the importance of keeping the business up all the time. There is no excuse for downtimes, most especially for websites that are expected to be up whatever the time is. As such, Transit developers deployed as 24/7 friendly support desk to answer the queries of users who have downloaded Transit. Airfares is a highly functional and multi-purpose Transportation WordPress Theme. This is designed specifically for company websites, as seen in the features it has. It is multi-purpose because, although it is marketed as a transportation theme, it can be used by companies in any field. It is customizable, too, just like other company websites. Airfares, however, is powered by MotoPress, which allows for an easy customization experience through a drag and drop page builder. Compared to other company websites, Airfares has a mega menu, allowing for many categories that can accommodate a plethora of services and products that big company websites usually offer. Airfares can support both video and image files, in case companies think they want to push it a bit further with their content. It also has a contact form and newsletter subscription. Overall, Airfares is a simple, clean, and highly-functional theme for those companies who want a straightforward website. 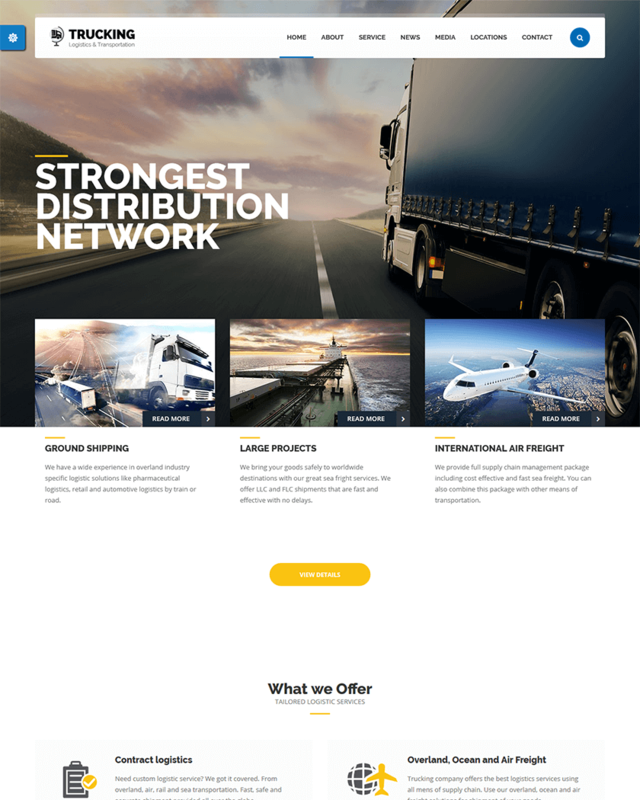 Another WordPress Theme designed for companies, specifically companies in the transportation industry, Odysse follows a clean theme that highlights the brand of the company. Its default theme features a full width background image, but what is fascinating about this design is that the full width background image has a gradient accent from top to bottom (starting from the header down to the middle part of the background image). Odysse does not like unnecessary frills. Right below the full width background image, visitors can already see the services of the company, should the website builder of the transportation company decide to place them there. It is actually a good spot to place specific information that companies would like to highlight. The layout, however, can also be changed. Odysse ensures that the company still has options to tweak the interface of the theme depending on the needs of the company through its drag-and-drop builder, custom widgets, and live customizer. 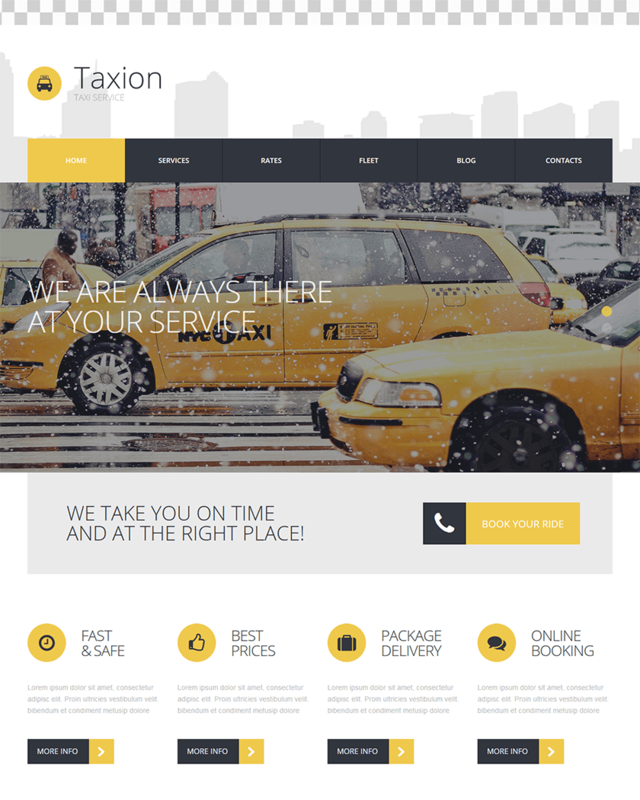 Fast and Furious Cabs is your modern and quirky Transportation WordPress Theme. It is designed to look professional yet interesting at the same time. Fast and Furious Cabs actually has standard features, such as being fully editable, responsiveness, capacity to accommodate custom type posts, translation-ready, and SEO optimized. Once a customer purchases this theme, he or she automatically gets a lifetime of updates, too. The developers are eager to keep updating the theme to ensure you get your money’s worth. What really makes Fast and Furious Cabs stand out from all the Transportation WordPress themes out there is that, even though it looks very professional, it does not make the company look rigid, making the visitors feel like the company is easily relatable. As it is modern and eye-catching, Fast and Furious Cabs actually garnered a rating of 4.5 over 5 stars. Customers really liked how fully customizable it is, making the design quirky or just plain clean, depending on the wants of the user. Overall, it allows the user to fully own the theme easily and without hassle. Unlike Fast and Furious Cabs, Auto Care is corporate theme, only a bit more creative in terms of the default layout. In terms of theme features, Auto Care is pretty much standard. 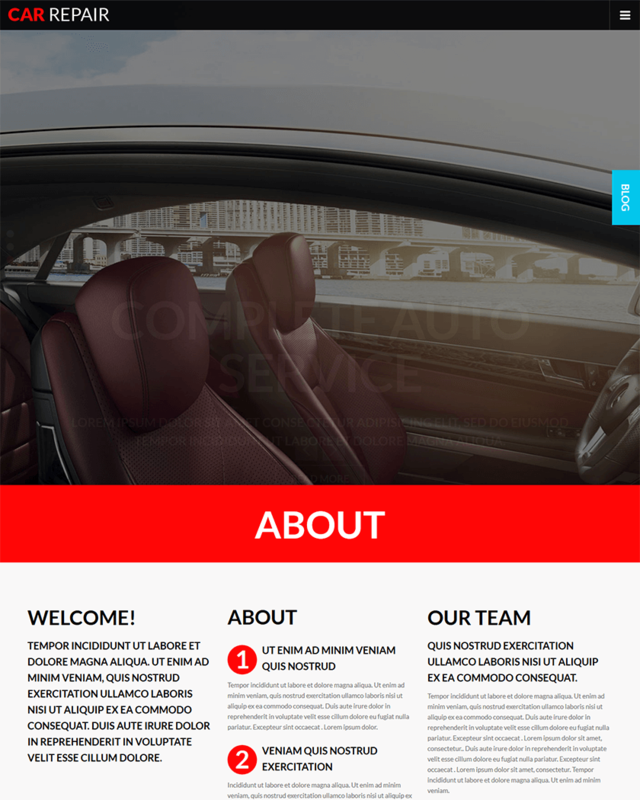 The default layout of Auto Care has a full width homepage layout where a background image can be put. However, it has sliders with smooth animations, so visitors can already see the services, and whatever the company wants to highlight, just from the homepage. This is actually pretty useful since the majority of people going online can’t be bothered with clicking too many links, especially if they don’t really need the services. With this slider, you already get the attention of your visitors. Other than that, Auto Care is basic in terms of features. It is responsive, has customization options, and is SEO optimized. Users also get a lifetime of updates once they have purchased this theme. 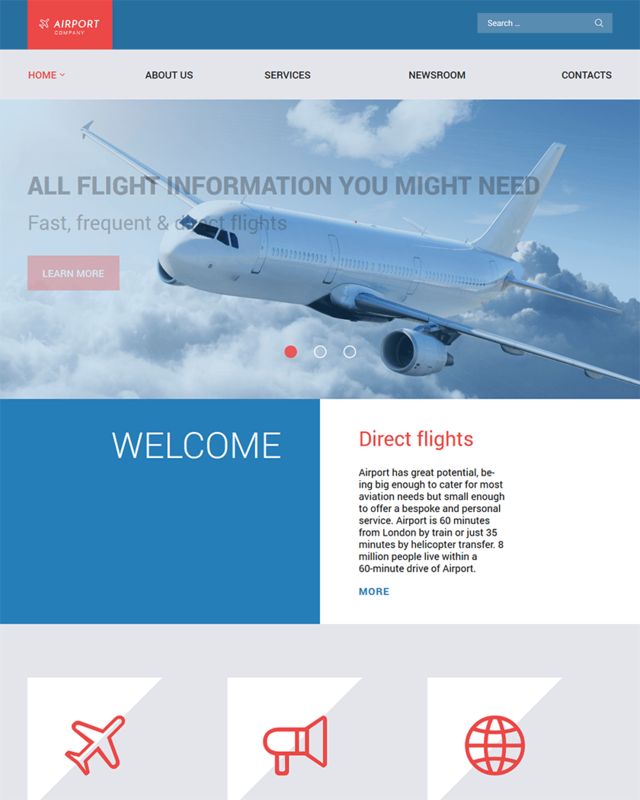 Private Airline is a very basic Transportation WordPress theme. It does not seem to try to stand out or to try to be eye-catching. It seems to rely heavily on the creativity of the developers of the transportation’s company website. All it wants is to provide all the necessary features through a simple template. The layout Private Airline has a header with the logo as well as links to categories, a full width background image right below it, and the rest of the website content below. There is nothing spectacular about it, but the design is functional. As usual, the theme is fully customizable, can accommodate custom post types, is multilingual, is SEO optimized, and easy to install. 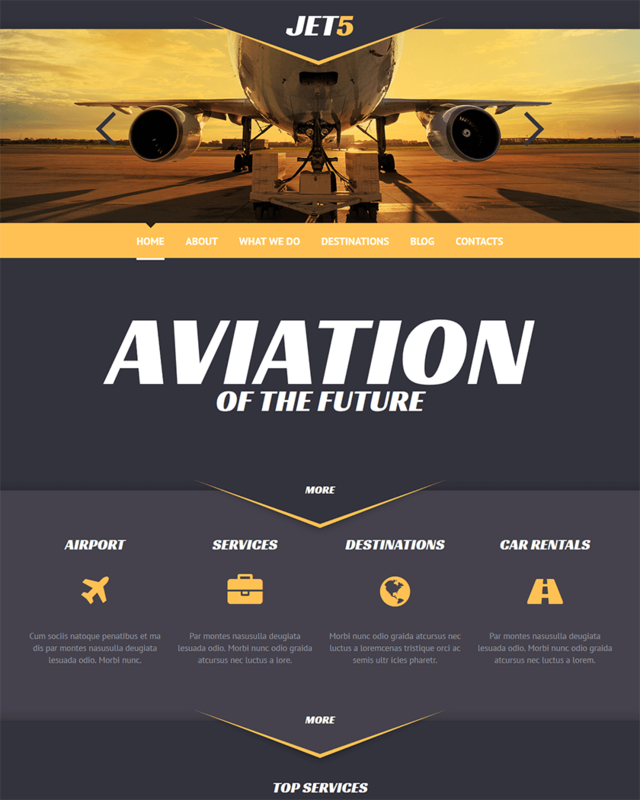 For a company to stand out with Private Airline, the developers of the company website have to use the theme as just an ordinary template. They have to be creative enough to look different and unique with a template as clean and plain as Private Air. Overall, however, Private Airline is highly functional. Transportation and Logistic is another modern theme that looks highly professional yet very relatable. It does not seem to evoke a sense of rigidness from the transportation company. It exudes an efficiency, which works well for the company. 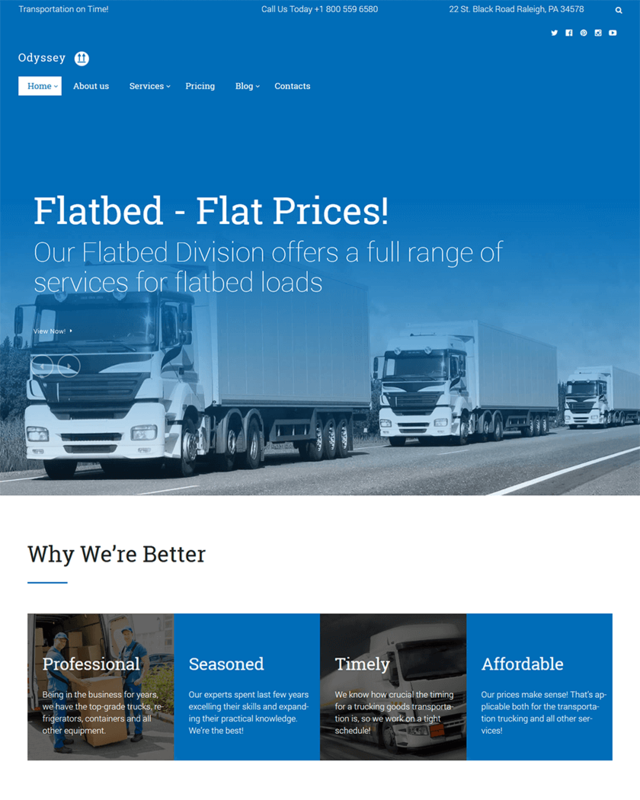 The Transportation and Logistic WordPress Theme, though, is not for every transportation theme out there. 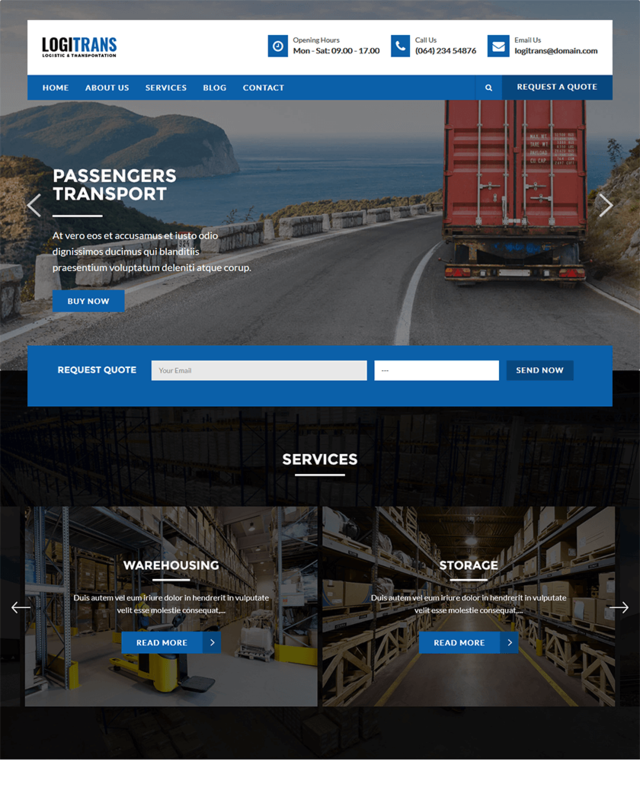 While it is highly customizable so company websites can easily just use the theme as a template and remove traces of the default layout, the theme was designed for a specific kind of transportation company. Companies have their own branding, so if your company is known for being a premium transportation company with a niche market, the Transportation and Logistic theme may not be for you. This is unless, of course, you want to come off as a more casual-looking but effective company. 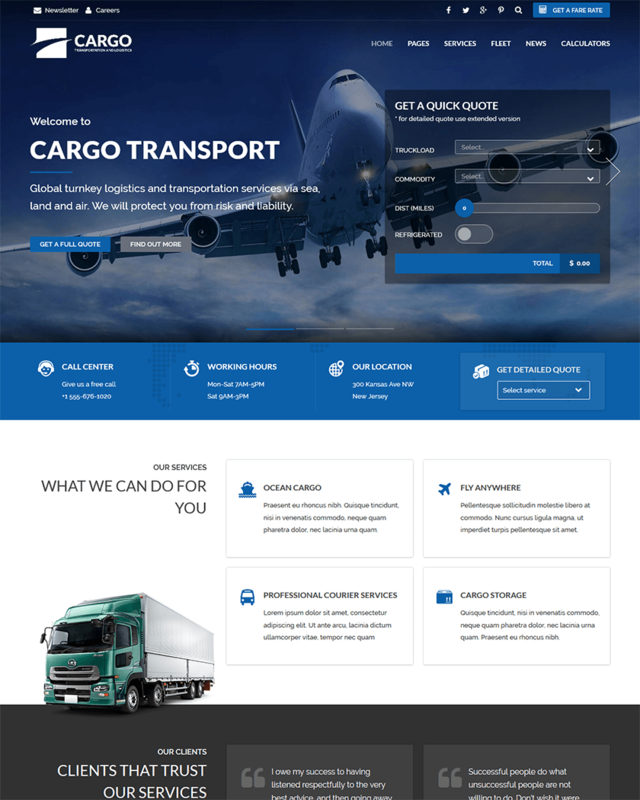 Transportation and Logistic theme bears standard features such as being fully editable, SEO optimized, multilingual, and many others. Trucking is the ultimate theme for companies in the transportation industry. 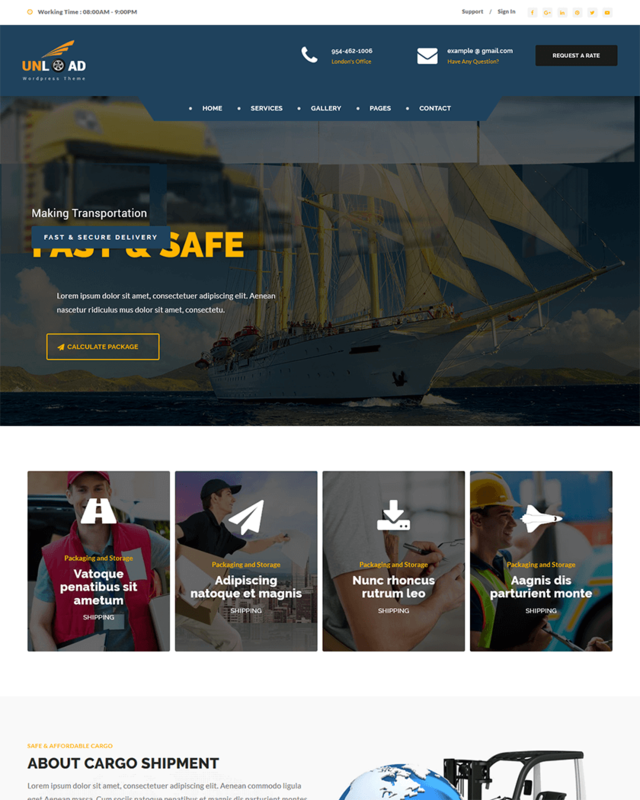 Though it may seem like a standard website, Trucking was designed by developers who really thought of creating a theme for transportation companies in mind. First of all, the developers conducted research on the transportation industry, ensuring that what these companies need on a site will be present in Trucking. This is highly evident in some of the features of the Trucking theme, which is obviously specific to the transportation industry. For instance, Trucking has customizable icons that are transportation and logistics-related. You can choose from 167 custom transportation and logistics icons, making you even more visual and creative in your website for your customers. Other features are pretty much standard, of course. This includes a content maker page builder, a demo, the ability to be responsive in any device, the capacity to be translated in several languages, and is SEO-ready. In terms of features and even layout, Transport is your average Transportation WordPress Theme. Sure, it has a great layout as it is clean and simple, but it is not eye-catching. Upon visiting a website with the default layout of Transport, visitors will feel that they are on the site for a business transaction. While that is perfectly fine, it does not make the visitors feel as if they need to keep going back for the services that they need because everything looks plain. 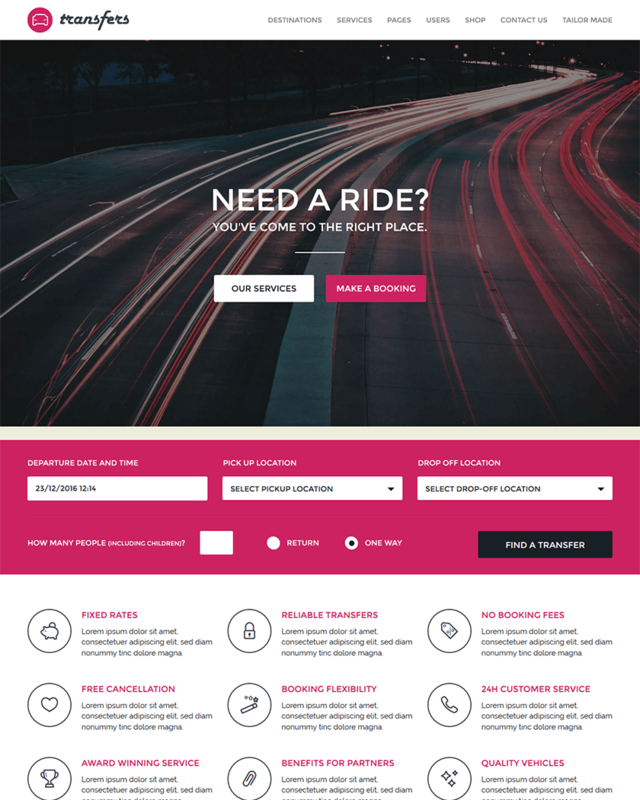 Transport, however, has eight unique homepages, so there is still a chance to make your transportation company website as beautiful as you want it to be. The theme also allows you to choose from Google Fonts, and a huge variety of colors for website accents and branding. The theme is also responsive to any mobile device there is, and it is compatible with a lot of widgets and plugins that you might need as a Transportation company -- customization-related plugins and widgets, and even business-related ones. Cargo is another clean, simple, and very direct transportation WordPress themes out there. It is very similar to a lot of themes specific to transportation, but it still has a few offerings to compensate for the average layout. Cargo is proud of its offerings related to customization of the theme. It has over 25 header and portfolio layouts, 823 icons, over 50 page elements to play with, and over 600 Google Fonts to choose from. Other unique features include a cost calculator, which is surprisingly very helpful for customers; and a rapid composer, which is basically a fast and convenient way to customize the site. Standard features include being responsive and being translation-ready. If you want a straightforward company website with a few quirks and feature that not a lot of transportation website has, then Cargo is perfect. The highlight, however, is really the cost calculator, which, although a small feature, can really be a gift for customers. 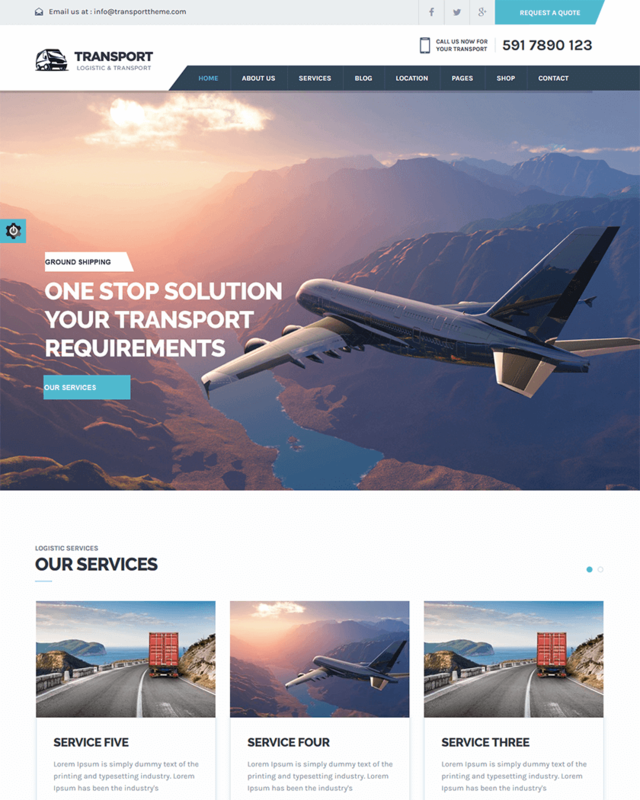 Global Logistics is a sleek, modern, and professional-looking Transportation WordPress Theme that can make an impressive start for transportation companies. The design is really beautiful, using icons and well-spaced elements to make up the site. This makes the user experience of the site interactive, making potential customers feel like they are looking at something interesting. The user experience of this theme definitely keeps customers on your website, prolonging the attention they are giving for your company. What’s good about the design is that it is highly-responsive, so the beauty of the design translates to any mobile device. Global Logistics ensures that the sliders integrated in it are mobile-friendly. It still has the standard features of regular themes such as translation options, customization options, SEO optimization, and many others. It also has a support team to answer queries of Global Logistics users. 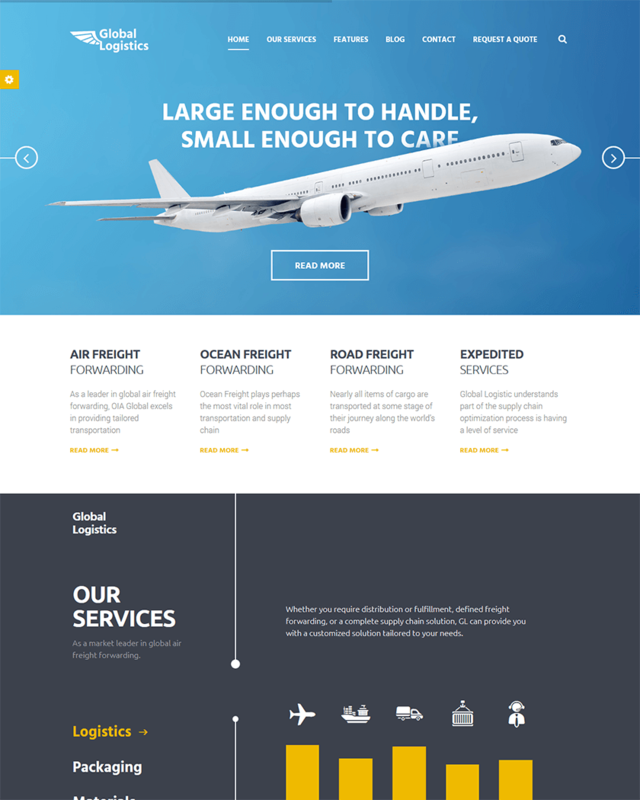 Overall, Global Logistics is definitely an above average transportation WordPress theme. 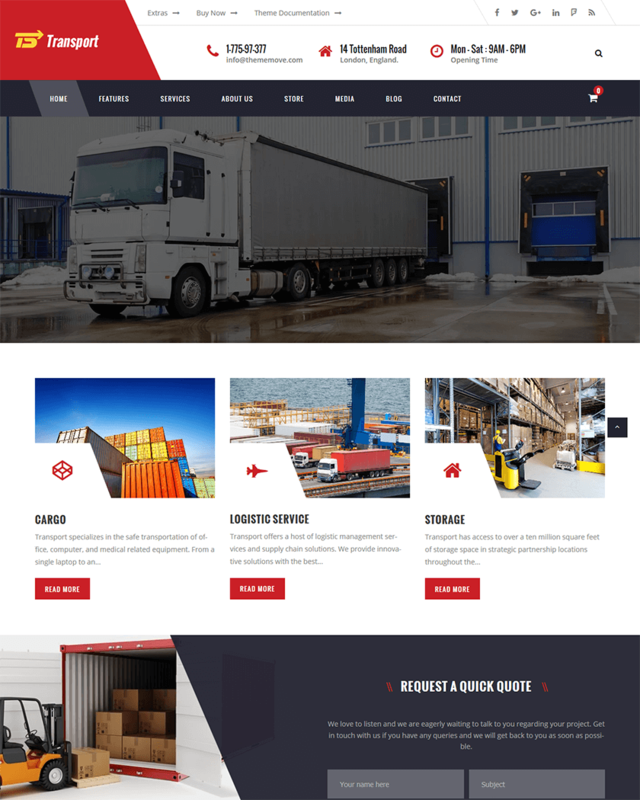 CargoPress is not exactly any different from other Transportation WordPress theme. Developers of this site researched thoroughly about the industry, ensuring that they include features that will be used by transportation companies. However, in terms of the layout, CargoPress seems very normal. The only small difference CargoPress has from other layouts is that the grid content boxes overlap with the background image for a quirky look. It also has a sleek header where the logo and other categories and information can be placed. The theme is good layout for company websites, particularly in the transportation industry due to the features it has. Its sidebars and widgets can accommodate a lot of information that transportation companies might need to put in the website to service their clients. CargoPress is also very easy to use and install. In fact, developers prepared a video demo on how to install CargoPress. It is also responsive and retina-ready. 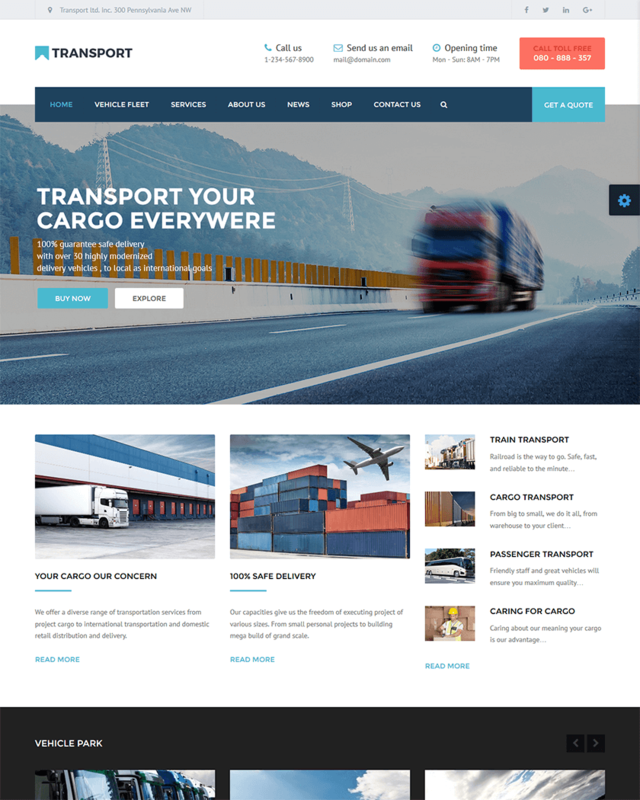 Logistic, not to be confused with Logistics, is another template theme for company websites in the transportation industry. It’s easily customizable, but it basically has necessary features for transportation company needs. As a template, Logistic is highly customizable. In fact, it has eight homepage variations, boxed and full width layouts, font icons, the Google Web Font feature, and a variety of colors. Logistic is actually a very powerful theme. It has shop pages for shopping cart, built-in WooCommerce, a store locator with the use of Google Maps, and compatibility with MailChimp for newsletters. In addition, Logistic can be installed offline and manually, which is a feature that not a lot of Transportation WordPress themes have. This theme is also responsive and retina-ready, and garnered an A+ grade in terms of Page Speed so you are sure that your company website is fast-loading. A simple theme, Logistic is pretty powerful, surely bearing the needs of companies. Transfers is one of the quirky, modern, yet professional-looking Transportation WordPress Themes. Seeing how it looks, it aims to be an eye-catching and relatable theme yet exudes professionalism through high-quality service. Transfers was created specifically for companies in the transportation industry. With its features, it seems that it targets companies who rent cars for service. This transportation WordPress theme has all the standard features of the other WordPress themes of the same target market. However, what sets Transfers apart is that it has powerful booking system feature right up in the theme. This booking system allows customers to check the availability of the vehicle they want to rent. This includes the pricing, which differs per season as well as per person and per vehicle, unlimited transport types; unlimited pick-up and drop-off locations; and different modes of payments such as PayPal, bank transfers, and cheque payments. It is no wonder that Transfers was selected as an AWWWARDS nominee for excellence in design, creativity, and innovation. 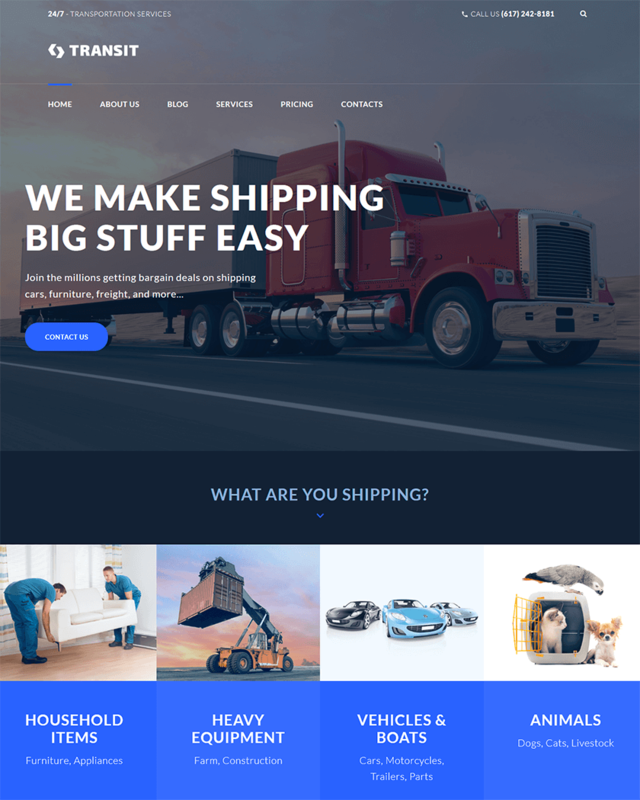 Another template Transportation WordPress theme, Logistics/FastEx has the standard features, and even the look, of most transportation WordPress theme websites. It really is no different from Logistics, Logistic, and CargoPress. It has customizable icons you can use for the website, a responsive design, Google Fonts, together with fonts that are already included in the theme, and many others. Logistics/FastEx, however, takes pride in its Quick Quote through Contact Form 7, in case visitors of the site who are potential clients want to know how much the company’s service is. Another difference would be its parallax feature, which allows the website to have a 3D effect when the visitor scrolls down by making the foreground move faster. It also easily customizable with a variety of options from colors and skins, is SEO-optimized, and has a one-click installer for easy and convenient installation. Overall, Logistics/FastEx is a standard transportation theme with a bit of quirks. Unload seems like your standard Transportation WordPress theme, and it might be rightly so. However, it sticks to what the industry needs, as seen in its features, specifically an important feature that not all transportation WordPress themes seem to bother getting: a tracking system. The tracking system allows customers of the transportation company to track their services or their packages. This is a very important feature as customers always need to have information at hand, and companies should have that ready for them. This allows for transparency between companies and customers. Unload also has four service listing styles, six gallery listing styles, three blog listing styles, and two teams listing styles, and a packaging listing style for the company. It also allows for an easy customization through a visual composer and a back-end panel that has unlimited options for customization. Unload is generally a standard theme, save for its tracking system that really does its job as a good transportation WordPress theme. 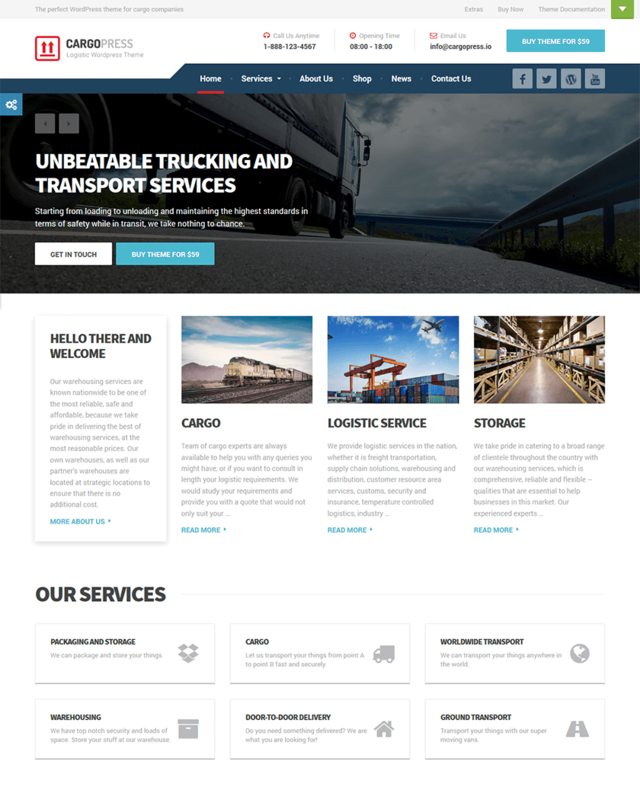 Logistic/LogiTrans is your average all-you-need transportation WordPress Theme. It is clean and simple with enough features for transportation company needs. First off, the theme is very easy to use as you have full control of every aspect of the site you would like to customize. In addition, it has a live customizer that makes customization visual and, therefore, convenient. It’s easy to avoid mistakes with it. The theme is also easy to install through its one-click import demo. If you want the look of the demo site, you can easily adapt the look to your website. Logistic is also fully responsive, so you are sure that you can also reach customers who are usually on mobile devices. This theme is SEO optimized, which is good for the business as it establishes your online presence. This means that when your company and your services are typed in on search engines, your company website will surely be one of the results. Although a relatively good theme, customers have complained about glitches yet they are compensated for by the really good support from developers. 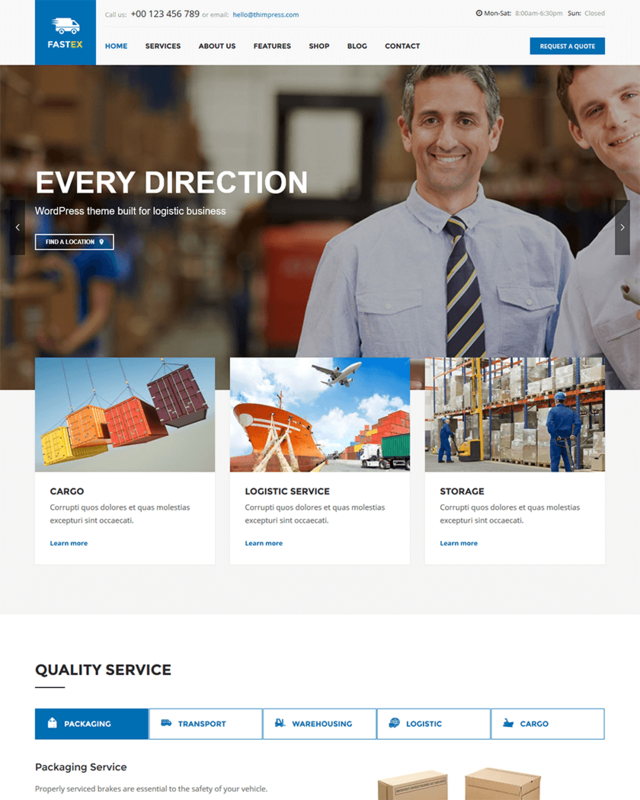 Canava is Logistics and Business responsive WordPress theme especially created for logistic & transportation companies. It is very easy to setup and use. The theme comes with loads of great features like custom components, web fonts, animated content & powerful CSS3 animations. We studied and reviewed hundreds of logistic sites across the web before planning the features of the theme and plugins to ensure we covered all functions and abilities. This WordPress theme will help you get your site up and running quickly, provide powerfull user and admin experience, Of course, you can use this theme also for other business. It can be easily use for any kind of website. 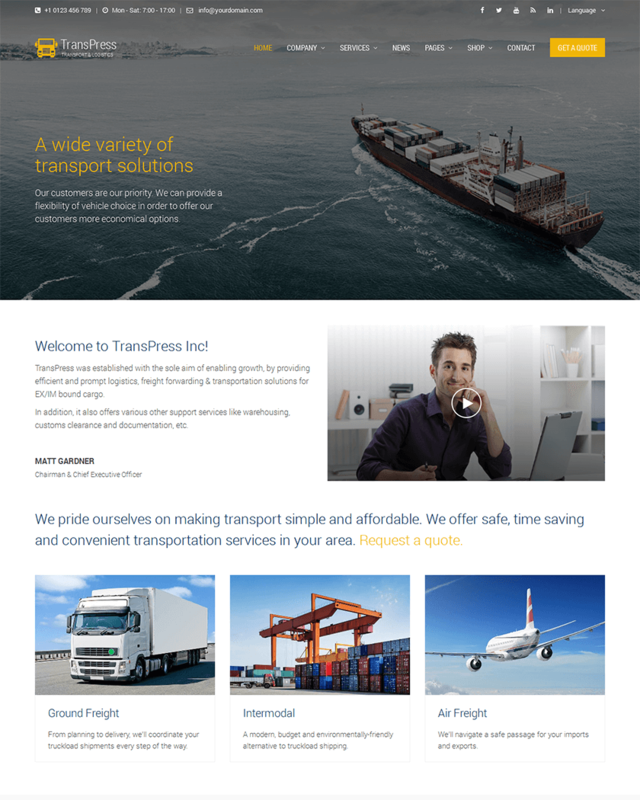 TransPress is a most complete premium WordPress theme created for transportation, logistics & Warehousing companies. This theme for WordPress is very easy to install, setup and use. With TransPress you can make & customize your company website easily with the intuitive drag and drop Visual Composer plugin and flexible theme options. It will help you get your site up and running in less than one minute with the one-click demo installation. TransPress covered all the necessary features and fuctions when theme development. With TransPress your website stand out from the crowd which will help you turn your site visitors into real customers. Awesome themes collection of Transportation. Transport is my favorite WordPress theme.